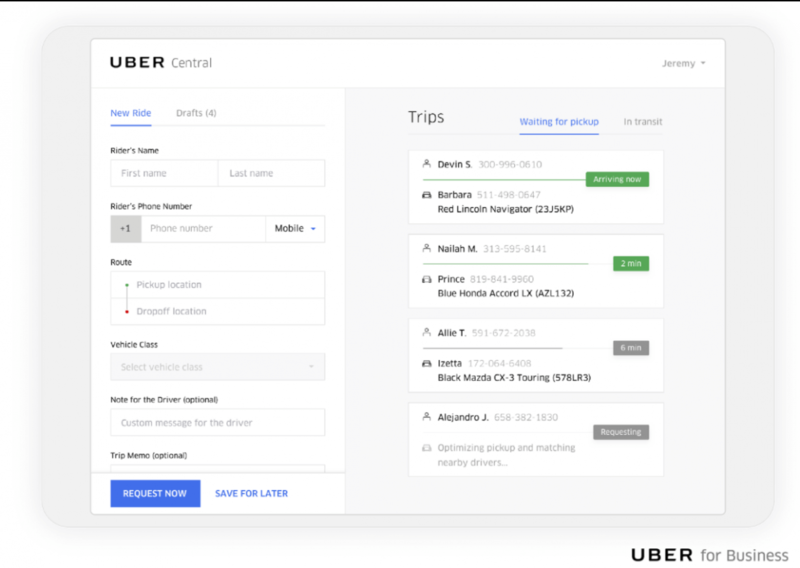 After running a pilot program with over 8,000 businesses, Uber is officially launching Uber Central, a dashboard that will let companies request, manage, and pay for multiple Uber rides for others. The service expands upon the existing Uber for Business platform which already allowed employees to hail rides themselves and have their company pay the bill. With Uber Central companies can extend those free rides beyond employees and have an administrator coordinate multiple rides at any given time. UberCentral can be accessed via a standard web browser or through the Uber app on an iOS or Android tablet. From there it’s possible to request a ride and share location and client information with drivers. The passenger doesn’t need to have an account with Uber or have the app installed on his or her phone -- they’ll simply receive an SMS with their driver's information as well as a link to a map with live tracking. The person doing the booking can also keep track of multiple rides and billing details from one central location. The ride-hailing company offered a few examples of how companies used UberCentral during the trial run. The Hotel Angeleno in Los Angeles, for instance, booked airport rides for guests as they arrived in Los Angeles and as they left the city. The hotel also booked rides for users into the city when requested. In another example, Roadside assistance provider Agero offered rides to stranded customers whose cars needed to be taken into the shop. Agero identified the customer’s most convenient pickup location, requested a ride from the Uber Central dashboard, and sent help in an instant. Uber charges a 10% premium applied to all rides taken through Uber Central. Businesses can assign limits as to who is authorized to request rides at selected times and the type of ride.